With the International Furniture Fair in Milan coming up soon, we're starting to look at sustainable design around the world. What do we mean by bioclimatic architecture design? An important question for all architects who care about sustainability, to be addressed during the Bioclimatic Architecture workshop organised by the Green Hub Cultural Association in collaboration with the Pistoia Association of Architects, Designers, Landscape Architects and Curators (Ordine degli Architetti, P.
Italian architect, Daniele Menichini added a private home to a hotel by inserting an eco-sustainable module into the existing building. Green_Zero. Naturally chic hospitality by Daniele Menichini. Living in symbiosis with nature shouldn't necessarily mean doing without. GREEN_ZERO. Evolution of widespread hospitality. 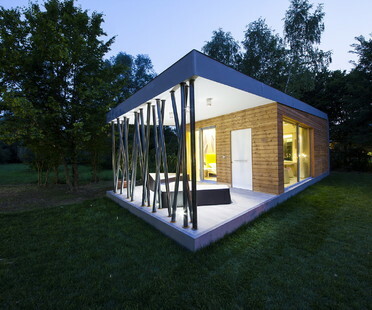 Italian architect, Daniele Menichini is characterised by his “green” approach to design. Architect Daniele Menichini drew his inspiration from the woods for the hotel’s interior design. The natural element prevails in both the design choices and the installations for saving energy, recycling and ensuring sustainability.